Hi everyone! It's Jackie here with your FINAL challenge for today! Haven't all of the challenges been fantastic today? I hope you'll try to play in some of them because there are some FABULOUS prizes up for grabs! Challenge: I LOVE to add stitching to my projects! I love how it finishes off a card with just that little something extra. My challenge to you is to add some stitching to your card or project! Don't own a sewing machine? That's okay....faux stitching is fine, too! Just add stitching!! KEYWORD: Upload your creation to your blog or online gallery (or both). 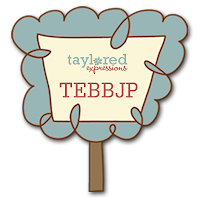 If you’re uploading to online galleries, use the keyword TEBBJP. Then come back to this challenge and leave a comment with a direct link to your creation! In order to be eligible for the prizes, you must leave a comment with a link to your card by midnight PST Wednesday, September 9th. PRIZE: I will choose my favorite creation from among all the participants and mail you the cards I created for this challenge along with a $10.00 gift certificate to the TE Store! I combined my challenge with Karen Giron's sketch challenge, TEBBKG! I also used the Beary Special set from Taylor's Whimsical Wishes Line. I am in love with this Teddy in the backpack!! Can you see all of my stitching? I was dying to add some brads or ribbon, but I really wanted to showcase all of the stitching!! Hope you like it! LOVE your card Jackie! What great colors and DP, and I love that pattern pieced on the bookbag. Great challenge Jacks! LOVE your gorgeous card! Fabulous challenge. I sew on my cards regularly so this is right up my alley! Your card is REALLY fantastic!! I should break out my sewing machine and learn to stitch on cards, but until I do... here's a little faux stitching (which I combined with TEBB sketch challenge). Thanks! I love stitching on cards! Here is my entry. Here is mine combined with Denise's challenge! Your card is totally yummy! I love what you did with the backpack too! Great challenge girlie! Thank you for hosting such a great challenge! You made me bust out my really old Making Memories embroidery floss! *lol* I'm so glad I found a card to use it on - I KNEW I was hoarding all that stuff for something! Great card. I love the layout and the colors. Here is my card for the challenge! It was a lot of fun. Thank you! 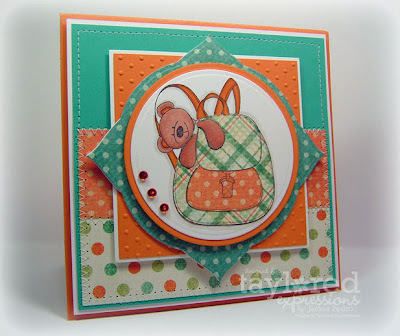 Hi Jackie, I loved doing the faux stitching and have provided the link to my card below. PS Your card is beautiful. Jackie this was a great challenge, I got to try out Karen's Janome Sew mini - I can see why so many people have then! Fun challenge; I really enjoyed it!